KEIZER, Oregon -- It was inconsequential and wacky, but Boise's Trey Jacobs and Daniel Jipping can say they pulled off a triple play at dinner parties and barbeques for the rest of their lives. The Class A Short Season Hawks duo combined for the unconventional 5-3 triple play in a 9-6 loss to Salem-Keizer on Tuesday. "A triple play is a triple play, and when it's a little weird, it's a little better," said Jacobs III, who added it was the first triple play he's ever been a part of. "When you throw some more into the mix, it's just all the more fun." The Volcanoes loaded the bases with no outs in the eighth inning. But with reliever Keinter Olivares on the mound, they erased any threat of extensive damage after Ricardo Genoves hit a chopper down the third-base line that was ruled fair. The runners seemed to think it was foul, but Hawks third baseman Jacobs III took action regardless. He tagged out Wander Franco, touching the bag at third for the force on Aaron Bond and tossing across the diamond to dispatch Genoves -- who didn't even run out of the box -- at first. "Off the bat, it looked foul, but they called it fair, so I tagged the runner at third, I stepped on third and then threw it to first," the North Carolina-Pembroke product said. "When I fielded it, I was thinking go home and get the lead out, just so they don't score again, maybe we turn a double play, best-case scenario. Then I realized everyone froze, so I decided to go ahead and get out of the inning." The Volcanoes threw their arms up in shock after the play unfolded. Salem-Keizer manager Hector Borg raced out of the dugout to argue because he thought the ball ricocheted off Genoves' foot. "If he gets it right, it kills everything," Borg said. "It's a dead ball, done. ... Honestly, I could have missed it. But it looked like the ball changed directions and went off Genoves' foot." Top Giants prospect Joey Bart collected four RBIs, including a two-run double that gave the Volcanoes the lead in the eighth and Franco finished with a double, a single and three RBIs. Terrin Vavra went yard and doubled for the Hawks. 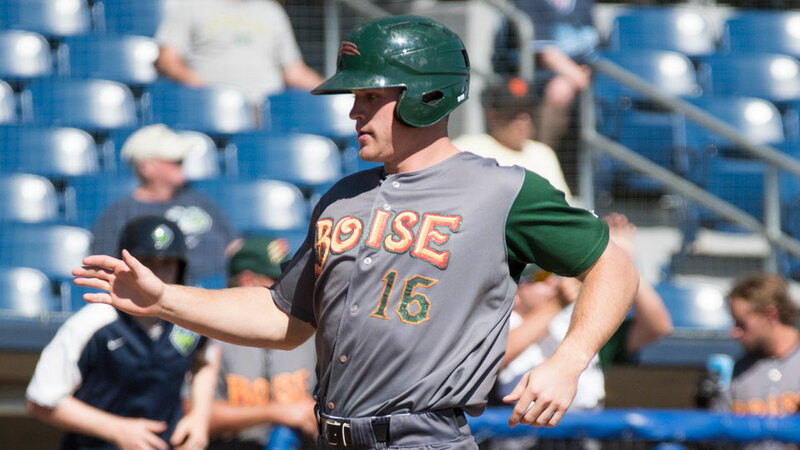 Tri-City turned the previous triple play in the Northwest League against Boise on July 1, 2014.